As parents, we do everything possible to keep our children safe, but we can’t always predict all the risks. This happened to Daniel – his young son was just starting to stand up and explore, and Daniel couldn’t predict that his young son would try to climb out of his crib. But, his son did climb out of the crib, and fell onto the hard floor. He sustained injuries to his face, and thankfully, after a short period of observation in the ER, was able to go home, and is growing up to be a strong, healthy little boy, but it could have been much worse. Daniel tried to find something that he could place on the floor around his son’s crib, but he wasn’t able to find anything. So he designed the DreamCatcher, a mat that is laid on the floor, with 8 separate, inflatable sections so that it can be configured to any nursery layout whether the crib is against one wall, two walls, or in the center of the nursery. DreamCatcher doesn’t restrict your child to their crib. 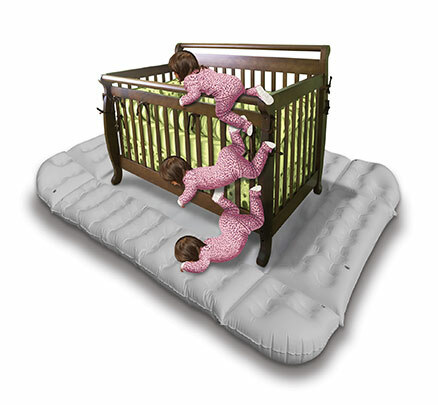 DreamCatcher aids crib safety by providing a softer place to land for curious, adventurous little ones. Do You Want To Shop The DreamCatcher?